Precision engineered safety eyewear featuring innovative 3M pressure diffusion temple technology. The spectacle temples self-adjust to fit a wide array of head shapes and sizes. 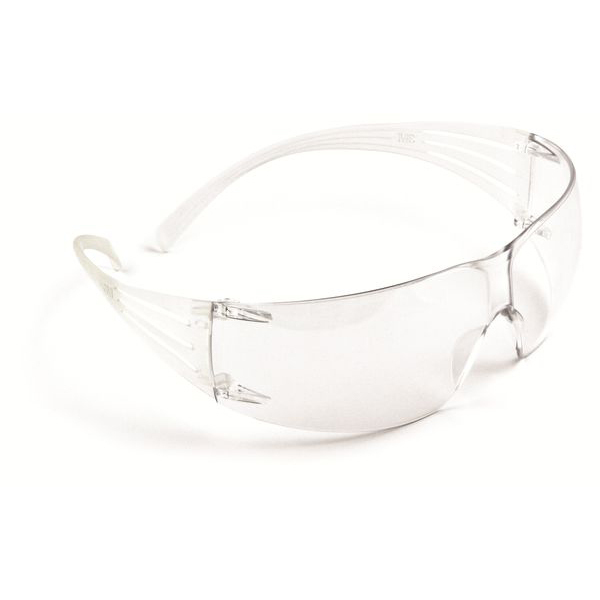 3M SecureFit SF200Series Spectacles provides noticeably higher levels of personal comfort and security of fit while reducing the need to stock multiple frame sizes. The stylish design weighs just 18g for lightweight comfort. Anti-scratch and anti-fog lens coatings. Ideal for use in a wide range of industries. 3M Pressure Diffusion Temple Technology. The flexible temple area of the spectacle diffuses pressure to enhance comfort while not compromising the security of fit across different facial profiles. How does the technology work?? The temple area of the frame incorporates flexible ribs that are slightly offset from each other. When the frame bends, the ribs flex in different directions to diffuse the pressure throughout the temple area. Product Code with Lens Marking: SF201AF-EU - PC Clear - UV - 2C-1.2 3M 1 FT.